How do brothers and sisters shape one another? 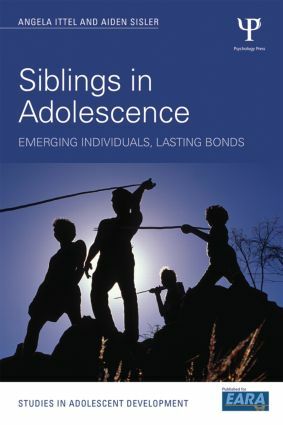 Siblings in Adolescence provides a comprehensive overview of the most up-to-date, international empirical research on the sibling bond during the critical adolescent years. The authors examine how the relationship impacts on adolescent development, as well as the effect on and within the family, using evidence from behaviour genetics, cross-cultural studies, and research utilizing both quantitative and qualitative methods. Siblings in Adolescence will be indispensable for advanced undergraduate and postgraduate students studying human development, and will supplement postgraduate courses for teachers, counsellors, and social, youth, and health workers. It will also be required reading for all those who work and do research with families and young people. Aiden Sisler is a doctoral student at the Institute of Education at the Technische Universität Berlin (TUB), Germany, where she investigates the intersection of culture, gender, education, and politics. With 15 years of experience working with children, and 28 years of being one, Aiden lends her expertise to projects dedicated to youths’ well-being. Angela Ittel is Professor of Educational Psychology at the Institute of Education at the Technische Universität Berlin (TUB), Germany. Dr. Ittel’s research focuses on gender and cultural factors in education as well as familial and school-based contexts for development.